“Hrrrmm. Learn Japanese, you will,” says Yoda to Luke. “But I want to learn the ways of the force,” Luke whines back. Maybe you don’t remember that particular scene, but chances are you’ve seen Star Wars and its little green Jedi dude, Yoda. Did you know that George Lucas (director / creator of Star Wars) was a big fan of Japanese film (and got the inspiration for Star Wars from Japanese director Akira Kurosawa’s “The Hidden Fortress?”). 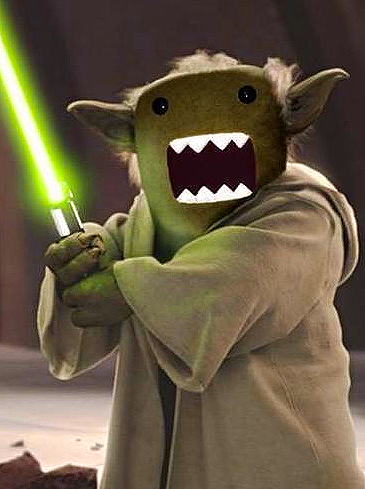 To show his Japan-love, he made Yoda speak kind of… strangely. But did you know that the way Yoda speaks mimics very basic Japanese grammar? It’s great for you, though, since we’re going to use it to make learning Japanese grammar so much easier for you English speakers out there. In this chapter we’ll start learning Japanese grammar in its most simple form. For most non-Japanese speakers, Japanese grammar is a bit of a challenge. Everything is, how should we say… flip flopped. Hopefully you have seen Star Wars and know how Yoda speaks. We’re going to mimic that (er… minus the grumbly voice). When it comes to basic Japanese grammar, Yoda is a perfect parallel of how everything works, at least in the beginning. When things get a little more complicated, though, we’ll have to ditch our little green friend for better things, but he’ll be a great foundation to work off of, plus you can skip a lot of the confusing issues that most Japanese learners end up going through. See, we make your life easier here!